A number of the form a + ib, where a and b are real numbers, is called a complex number, a is called the real part and b is called the imaginary part of the complex number. For example, 3 + i5, (– 2) + i√3 etc. Let z₁ = a + ib and z₂ = c + id be any two complex numbers. Then, the sum z₁ + z₂ is defined as follows: z₁ + z₂ = (a + c) + i (b + d), which is again a complex number. (i) The closure law The sum of two complex numbers is a complex number, i.e., z₁ + z₂ is a complex number for all complex numbers z₁ and z₂. (iii) The associative law For any three complex numbers z₁, z₂, z₃, (z₁ + z₂) + z₃ = z₁ + (z₂ + z₃). (iv) The existence of additive identity There exists the complex number 0 + i 0 (denoted as 0), called the additive identity or the zero complex number, such that, for every complex number z, z + 0 = z. (v) The existence of additive inverse To every complex number z = a + ib, we have the complex number – a + i(– b) (denoted as – z), called the additive inverse or negative of z. We observe that z + (–z) = 0 (the additive identity). Given any two complex numbers z₁ and z₂, the difference z₁ – z₂ is defined as follows: z₁ – z₂ = z₁ + (– z₂). For example, (3 + i5) (2 + i6) = (3 × 2 – 5 × 6) + i(3 × 6 + 5 × 2) = – 24 + i28 The multiplication of complex numbers possesses the following properties, which we state without proofs. (i) The closure law The product of two complex numbers is a complex number, the product z₁ z₂ is a complex number for all complex numbers z₁ and z₂. (ii) The commutative law For any two complex numbers z₁ and z₂, z₁ z₂ = z₂ z₁. (iii) The associative law For any three complex numbers z₁, z₂, z₃, (z₁ z₂) z₃ = z₁ (z₂ z₃). (iv) The existence of multiplicative identity There exists the complex number 1 + i 0 (denoted as 1), called the multiplicative identity such that z.1 = z, for every complex number z. (v) The existence of multiplicative inverse For every non-zero complex number z = a + ib or a + bi(a ≠ 0, b ≠ 0), we have the complex number a/(a2 + b2) + i (-b)/(a2 + b2) (denoted by 1/z or z-1 ), called the multiplicative inverse of z such that z by 1/z = 1 (the multiplicative identity). Given any two complex numbers z₁ and z₂, where 2 0 z ≠ , the quotient z₁/z₂ is defined by z₁/z₂ = z₁ By 1/z₂. Now, i3 = -i, i4 = 1, i5 = i etc. The polar form of the complex number z = x + iy is r (cosθ + i sinθ), where r = √x² + y² (the modulus of z) and cosθ = x/r , sinθ = y/r . (θ is known as the argument of z. 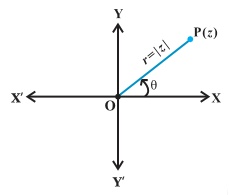 The value of θ, such that – π < θ ≤ π, is called the principal argument of z.